Apple has finally lifted the lid on the highly anticipated 3G incarnation of its iPhone. Apple co-founder and chief executive Steve Jobs made the announcement on Monday morning at Apple's Worldwide Developer Conference in San Francisco. Known simply as 'iPhone 3G' the handset will feature a faster 3G wireless connection along with a new look and lower price tag. 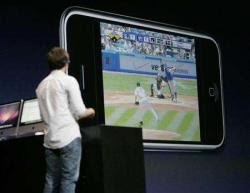 Apple claims that the new 3G connection will be roughly 2.8 times as fast as the Edge wireless connection on the original iPhone (Picture on right: Images from Major League Baseball can be seen on an iPhone during Steve Jobs' keynote speech at the Apple Worldwide Developers Conference in San Francisco, June 9, 2008. REUTERS/Kimberly White). The company also suggested that the new iPhone would run faster than other 3G handsets, claiming that it outperforms the Nokia N95 and Treo 750 by some 36 per cent. The iPhone 3G will also feature support for GPS hardware, a curved all-plastic backing and a flush headphone jack rather than the recessed jack that limited accessory options with the original iPhone. It will also add a new colour option, allowing users to purchase a white model rather than the classic black. When Jobs first spoke of a 3G iPhone last summer, he cited battery life as a major hurdle. The company appears to have overcome that problem, packing a claimed 10 hours of 2G talk time and six hours of web browsing into the handset. Apple plans to drop the price on the 16GB iPhone 3G to $299, while the 8MB iPhone will cost $199, roughly one third of the price for the handset on its release last June. The iPhone will be released initially in 12 countries, including Hong Kong, India and Mexico for the first time. In later months, Apple plans to expand iPhone's reach to some 70 countries. For the initial 12 countries, which includes the UK, Apple will make the iPhone 3G available on 11 July, slightly more than a year after the first iPhone debuted in the US. "As we arrive at the iPhone's first birthday we are going to take it to the next level," Jobs proclaimed. "We have taken everything we have learned and more, and we have created the iPhone 3G." We offer prompt shipping from our Store, The product will arrive at your destination within 2 Days Via UPS Courier Services.